Our Infant nativity retold the traditional folk tale of the Russian woman Baboushka who hears the news of the birth of Jesus, but at first refuses to listen. 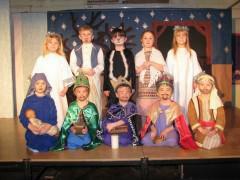 The cast consisted all of the children in Oak, Hornbeam and Beech. The children sang beautifully and the angels danced angelically. The cast of speaking actors were brilliant and performed confidently. Well done Oak, Hornbeam and Beech Class. For more photos please have a look in the photo gallery.